This article is about the song. For Kurt Nilsen album, see Have Yourself a Merry Little Christmas (album). For the House episode, see Merry Little Christmas. "Have Yourself a Merry Little Christmas", a song written by Hugh Martin and Ralph Blane, was introduced by Judy Garland in the 1944 MGM musical Meet Me in St. Louis. Frank Sinatra later recorded a version with modified lyrics. In 2007, ASCAP ranked "Have Yourself a Merry Little Christmas" the third most performed Christmas song, during the preceding five years, that had been written by ASCAP members. In 2004 it finished at #76 in AFI's 100 Years...100 Songs rankings of the top tunes in American cinema. The song was written while Martin was vacationing in a flat in the neighborhood of Southside in Birmingham, Alabama, that his father Hugh Martin designed for his mother as a honeymoon cottage. Located at 1919 South 15th Avenue (just down the street from his birthplace at 1900 South 14th Avenue), the house became the home of Martin and his family in 1923. The song first appeared in a scene in Meet Me in St. Louis, in which a family is distraught by the father's plans to move to New York City for a job promotion, leaving behind their beloved home in St. Louis, Missouri, just before the long-anticipated 1904 World's Fair begins. In a scene set on Christmas Eve, Judy Garland's character, Esther, sings the song to cheer up her despondent five-year-old sister, Tootie, played by Margaret O'Brien. Next year we may all be living in New York. When presented with the original draft lyric, Garland, her co-star Tom Drake and director Vincente Minnelli criticized the song as depressing, and asked Martin to change the lyrics. Though he initially resisted, Martin made several changes to make the song more upbeat. For example, the lines "It may be your last / Next year we may all be living in the past" became "Let your heart be light / Next year all our troubles will be out of sight". Garland's version of the song, which was also released as a single by Decca Records, became popular among United States troops serving in World War II; her performance at the Hollywood Canteen brought many soldiers to tears. In 1957, Frank Sinatra asked Martin to revise the line "Until then we'll have to muddle through somehow." He told Martin, "The name of my album is A Jolly Christmas. Do you think you could jolly up that line for me?" Martin's new line was "Hang a shining star upon the highest bough." Martin made several other alterations, changing the song's focus to a celebration of present happiness, rather than anticipation of a better future. On The Judy Garland Show Christmas Special, Garland sings the song to her children Joey and Lorna Luft with Sinatra's alternate lyrics. The lyrics Garland sang in Meet Me in St. Louis have been recorded with only slight variations by a number of artists, including Sinatra (in 1950 and 1963 single recordings), Bing Crosby (in I Wish You a Merry Christmas), Doris Day (in The Doris Day Christmas Album), Ella Fitzgerald (in Ella Wishes You a Swinging Christmas), The Pretenders (in the first A Very Special Christmas compilation), James Taylor (in October Road), and Luther Vandross (in This Is Christmas). In 2001, Martin, occasionally active as a pianist with religious ministries since the 1980s, wrote an entirely new set of lyrics to the song with John Fricke, "Have Yourself a Blessed Little Christmas," a religious version of the secular Christmas standard. The song was recorded by gospel female vocalist Del Delker with Martin accompanying her on piano. Although Ralph Blane is credited with writing the music for many of Martin's songs, Martin claimed in his autobiography that he wrote both music and lyrics to all of the songs in Meet Me In St. Louis and that "all of the so-called Martin and Blane songs, (except for Best Foot Forward), were written entirely by me (solo) without help from Ralph or anybody else." His explanation for allowing Blane equal credit for the songs was: "I was reasonably content to let him receive equal screen credit, sheet music credit, ASCAP royalties, etc., mainly because this bizarre situation was caused by my naive and atrocious lack of business acumen." Frank Sinatra's third recording of the song, backed by popular Hollywood arranger Gus Levene and his orchestra, was controversially used by director Carl Foreman in his 1963 anti-war film The Victors as the soundtrack backdrop (along with the carol "Hark! The Herald Angels Sing") to the execution by firing squad of a G.I. deserter in a bleak, snowy field on Christmas Eve – a scene inspired by the real-life execution of Pvt. Eddie Slovik in 1945. The New York Times film reviewer, while recognising the power of the scene, complained that "the device itself is almost as specious and sentimental as what [Foreman] is trying to mock". (2014) "Have Yourself a Merry Little Christmas"
On December 6, 2014, English singer and songwriter Sam Smith released a cover version on the song. The song debuted at number 90 on the Billboard Hot 100, the first time a version of the song has charted on the Hot 100. In Australia, the song charted at number 63, the second time a version of the song has charted, after Michael Bublé's version reached number 98 in 2011. ↑ Studwell, William Emmett (1995). "Have Yourself a Merry Little Christmas". The Christmas carol reader. Routledge. p. 136. ISBN 1-56023-872-0. 1 2 3 4 5 Willman, Chris (2006-12-22). "There's Something About Merry". Entertainment Weekly. Retrieved 2007-12-21. ↑ "ASCAP Announces Top 25 Holiday Songs" (Press release). ASCAP. 2007-11-12. Retrieved 2007-12-21. ↑ Martin, Hugh (2010). The Boy Next Door. Trolley Press. pp. 9–10. ISBN 978-0-615-36507-7. ↑ Dirks, Tim (1996). "Meet Me In St. Louis (1944)". The Greatest Films. Retrieved 2007-12-21. ↑ Martin, Hugh (2010). The Boy Next Door. Trolley Press. pp. 196–197. ISBN 978-0-615-36507-7. ↑ Collins, Ace (2001). Stories Behind the Best-Loved Songs of Christmas. Grand Rapids, Michigan: Zondervan. pp. 78–79. ISBN 0-310-23926-5. ↑ "The Christmas Special". The Judy Garland Show. Season 1. Episode 15. Los Angeles. 1963-12-22. 1:54 minutes in. CBS. CBS Television City. ↑ "The Carpenter and the King". The Voice of Prophesy. Retrieved 2007-12-21. 1 2 Martin, Hugh (2010). The Boy Next Door. Trolley Press. pp. 390–392. ISBN 978-0-615-36507-7. ↑ Leigh, Spencer (25 September 2015). Frank Sinatra: An Extraordinary Life. McNidder and Grace Limited. p. 335. ISBN 978-0-85716-088-1. ↑ Gary, Trust (December 19, 2014). "Hot 100 Chart Moves: Sam Smith Brings 'Merry Little Christmas' to Chart for First Time". Billboard magazine. Retrieved December 20, 2014. ↑ Ryan, Gavin (December 20, 2014). "ARIA Singles: Mark Ronson and Bruno Mars Stay At No 1". Noise11. Noise Network. Retrieved December 20, 2014. ↑ "iTunes - Music - Have Yourself a Merry Little Christmas - Single by Sam Smith". iTunes Store (US). Apple Inc. December 6, 2014. ↑ "The ARIA Report: Issue 1295 (Week Commencing 22 December 2014)" (PDF). Australian Recording Industry Association. p. 4. Retrieved December 23, 2014. 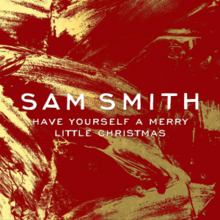 ↑ "Ultratop.be – Sam Smith – Have Yourself A Merry Little Christmas" (in Dutch). Ultratip. ↑ "Sam Smith - Awards - Allmusic". Allmusic. Retrieved January 28, 2015. ↑ "Sam Smith – Chart history" Billboard Canada AC for Sam Smith. Retrieved January 3, 2015. ↑ "Sam Smith – Chart history" Billboard Canada Hot AC for Sam Smith. Retrieved January 3, 2015. ↑ "ČNS IFPI" (in Czech). Hitparáda – Digital Top 100 Oficiální. IFPI Czech Republic. Note: insert 201552,53 into search. Retrieved December 27, 2015. ↑ "Chart Track: Week 51, 2014". Irish Singles Chart. ↑ "Dutchcharts.nl – Sam Smith – Have Yourself A Merry Little Christmas" (in Dutch). Single Top 100. ↑ "Archive Chart: 2014-12-14". Scottish Singles Top 40. ↑ "SNS IFPI" (in Slovak). Hitparáda – Singles Digital Top 100 Oficiálna. IFPI Czech Republic. Note: insert 201552,53 into search. Retrieved December 27, 2015. ↑ "Archive Chart: 2014-12-14" UK Singles Chart. ↑ "Billboard Hot 100: Week of December 27, 2014". Billboard. Prometheus Global Media. Retrieved December 27, 2014. ↑ "Billboard Adult Contemporary: Week of January 3, 2015". Billboard. Prometheus Global Media. Retrieved January 3, 2015. ↑ "Sam Smith – Chart Results: Holiday 100". Billboard. Prometheus Global Media. Retrieved 11 August 2015. "I'm Not the Only One"
"Reach Out, I'll Be There"
"Baby I Need Your Lovin'"
"Stop, Look, Listen (To Your Heart)"
"(Your Love Keeps Lifting Me) Higher and Higher"
"Have Yourself a Merry Little Christmas!